The flea siege began in March. First, I found a trail of angry welts up my foot. Then small dark dots appeared on my white sock, only to leap off when inspected more closely. After spraying and vacuuming in the house, we realized the bugs were in our yard, lurking under the agapanthus, leaping out from behind the trash bins to attack us. Why? We have no pets, and only the occasional possum or raccoon waddling through the yard. Better question: How do we get rid of them? There’s a gap in the research in such situations, because the most effective flea control targets the host animal, says Michael Rust, an entomologist at the University of California, Riverside. Rust has studied fleas for almost 40 years, and says he has gotten quite a few calls from both individuals and institutions about outdoor infestations, including an elementary school whose grounds were plagued by fleas from feral cats. So, what to do? Here's what I learned about these hardy, hard-to-kill parasites. 1. The bloodsuckers are common around the world. There are several thousand species of fleas all over the globe, and more than 300 just in the continental United States. Fleas tend to feed on mammals, but there are also bird fleas. The most common is the cat flea, or Ctenocephalides felis, which also feeds on dogs, wildlife, and humans. Fleas eat multiple meals a day, which is why they leave a trail of bites on their host. Female fleas tend to be larger than male fleas. They can lay up to 40 eggs a day and 2000 in a lifetime, which usually lasts a few months. A flea will go from larva to adult in just a few weeks, less time if the weather is hot and humid. 2. Dark clothing won't hide you from them. Fleas don’t prefer one human over another. Some people are just allergic to the anticoagulant fleas inject before feeding. In fact, humans are not a preferred host, because they have no fur to lay eggs in, Rust says. There is no proven human flea repellent. Deet, which is effective on mosquitoes, doesn’t seem to work, nor is there evidence that eating garlic helps, according to Rust. And no, they aren't drawn by the color white—though there may be something to them being drawn to yellow-green shades, which is why that hue is used in bulbs in flea traps (which have gotten mixed reviews). Fleas are usually attracted to movement, not color, so wearing dark clothing doesn’t fool them. It just makes them harder to see, Rust says. One upside to climate change: fleas don't like it, at least in cases of extended droughts. Flea larvae, according to Rust, are susceptible to drying out. And speaking of desiccants—diatomaceous earth, often touted as good for killing fleas, is not “super effective,” Rust says. 3. Flea circuses are real. This video won't help get rid of my flea problem, but it will distract me while I scratch. The Aztecs in Mexico included fleas in their sculpture bestiaries, and several centuries later, their descendants started a folk art called pulgas vestidas, which is literally dead fleas dressed in tiny costumes, with brides and grooms and mariachis (complete with instruments) as favored themes. No one quite knows how this started, but bored nuns in convents have been blamed. 4. Pesticides can be effective—but they may kill a lot more than fleas. Pets everywhere got a big break in the mid-'90s, when researchers discovered imidacloprid, the active ingredient in the popular topical treatment Advantage. A synthetic mimic of highly toxic nicotine, imidacloprid targets the flea’s nervous system, preventing nerves from sending signals to each other, paralyzing and eventually killing the flea. It is now the most popular pesticide in the world, but may play a role in bee colony collapse, especially in conjunction with other triggers. Before imidacloprid, pyrethrins (and pyrethroid, its synthetically made cousin) was the pesticide of choice for dog flea collars and shampoos; certain versions are lethal to cats. Found naturally in chrysanthemums, pyrethrins also affect the flea's nervous system, but some flea populations have started showing resistance. 5. 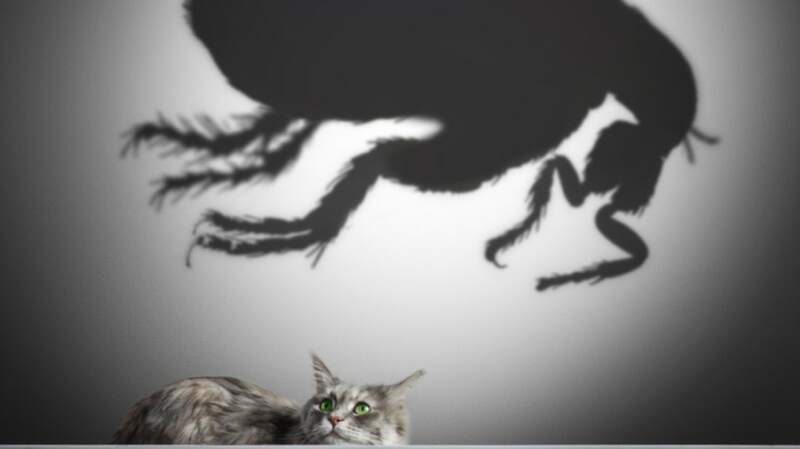 Can we defeat the flea? So when it comes to ridding our yard of fleas, what should I do? When you don’t have a host animal, tackling an infestation is tricky, Schappert says. Using a pyrethroid is a must, but so is dousing the yard with insect growth regulator (IGR)—also known as flea birth control. Hopefully that will work—at least until the next raccoon stops by.